Volunteer Recap: Why Wearing The Right Shoes In Rio Matters : Goats and Soda When public health student Robert Snyder visited Rio de Janeiro last summer to do volunteer work, he learned the hard way that Birkenstock clogs are not a wise footwear choice. 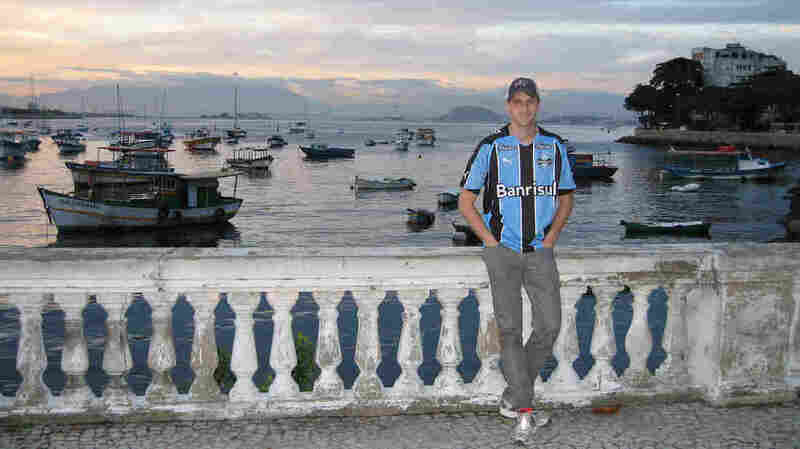 Robert Snyder takes a break at Baia de Guanabara, Brazil's second largest bay. Public health student Robert Snyder says he's been back and forth between U.S. and Brazil at least six times. While some trips were for fun, others were to study how diseases affect some of the country's poorest communities. Snyder, 28, who's pursuing a doctorate in epidemiology at University of California, Berkeley, is currently in Rio de Janeiro studying how diseases strike in the city's slums, or favelas. He's interviewing families to learn what puts them at risk for diabetes, TB and staph. Last summer, Snyder was there for three months, delving into the rate of high blood pressure in slums and comparing it with the rate in communities with better health care options. And on his very first day, he had an unpleasant encounter in Copacabana, a wealthier and more tourist-friendly community where Snyder was staying. I got mugged the day I got there. It was 8 o'clock on a Sunday night, and I wanted to go over to a friend's house. I was walking down the street and this kid and his girlfriend walked up to me. They pushed me against the wall, and he put a knife against my chest and said, "If you don't give me money, I'm going to kill you," in Portuguese. So I took out my wallet, gave them the money. His girlfriend put her hand in my pocket and took my cellphone, which I hadn't even activated yet. I went to the police station right next to my house, and they took me to the other side of the city to a special police station for tourists. I remember the female officer was like, "Oh, next time that happens, just punch him in the face." And you blame ... your shoes? [The mugging] happened because I wore the wrong shoes — at least that's what people told me. In Brazil, everyone has these plastic flip-flops called Havaianas, a famous Brazilian brand. You have to wear them everywhere, and if you're not wearing them, especially in Rio, people know you are not from there. I had on Birkenstock clogs, which I have since learned no Brazilian would ever wear. The ironic twist was that we're trying to assess all these different diseases, and in public health, we think of violence and crime as kind of a disease. And now my [experience] will contribute to the statistics we're trying to study. Things like interpersonal violence — murder, assault — have a serious impact on public health of a community. Were you afraid to walk around Rio? The day after I got mugged, [a physician at my clinic] said, "I've lived here for 40, 50 years and I've never been robbed!" He was a member of the old left [Democratic Party] when Brazil went through a dictatorship. Brazil always gets this bad rap — fair or not — for being a relatively dangerous place to walk around. But he said that ironically, when the dictatorship was going on, it was much safer because they would crack down [on crimes] with an iron fist. And there was a lot more segregation between the slums and nonslums. An important phrase to know? The word that anyone who goes to Brazil should know is saudade. It doesn't have a good translation in English, but it's this longing feeling for the people you really care about and your country. It's a very emotional word that captures the Brazilian culture. When you talk to someone, you would say estou com saudades, and that means I am missing you. It's great to have someone say that about you. Best thing you brought from home? Peanut butter. They don't really have peanut butter in Brazil, and if [the shops] do, it's really expensive, about $10 a jar. It's a comfort food. When I get home, I would eat peanut butter with apples and it makes me saudade for the U.S. I bring the extra big jugs every time I go. Is there a misconception about slums? We have this idea that these communities are homogeneous and they're all these places of abject poverty and misery. While there are certainly some components of it that are like that, what really struck me the most was how happy and proud people were to be living there. There's this idea of social capital: People get along well, and they look after each other. Get some Havaianas. It's the only way you'll be able to blend in. This post has been updated to include information about where Robert Snyder was mugged. He was walking in the more tourist-friendly neighborhood of Copacabana, where he was staying at the time.